A friend loaned me one for testing and while this article is based on preliminary results, I am now quite happy with the results as of the latest update. Utilizes new Cree ML-E emitters rated at 1.6 watts per emitter. These emitters allow for more voltage variance with high energy output per watt used. Editorial: These new emitters seem to run even cooler than earlier emitters with a voltage variance that likely will be less sensitive to voltage spikes that moisture in an aquatic environment can cause. Utilizes standard TMC Mounting Options except for female Teflon screw/bolt receptacle. Here is a simple picture that essentially show light energy penetration through two layers of white computer paper. One shows the AquaBeam 600 XR-E Reef White with proven excellent results against the new AquaBeam 600 Ultra ML-E Reef White. 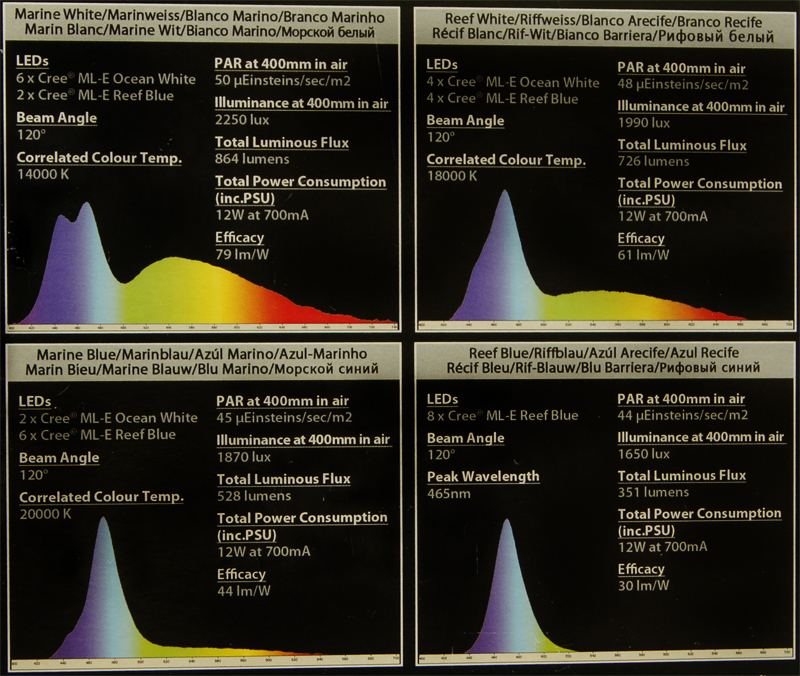 This is the exact color difference utilizing a Reef White 600 and a Reef White 600 Ultima; each wrapped with two layers of computer paper, then placed the maximum optimum PAR distance (400mm) over more computer paper. What I find interesting & did not expect is the new “600 Ultra ML-E Reef White” produced slightly more brighter white light with a higher percentage of blue emitters than the previous model. The new 600 Ultima ML-E series is different from the previous series. *The Marine White now utilizes (2) Blue ML-E along with (6) 10K ML-E Daylight (Ocean White) to obtain the 14K the previous version produces with only 14K XR-E emitters. See this picture to the left for TMC published Spectrographs and information (click to enlarge). 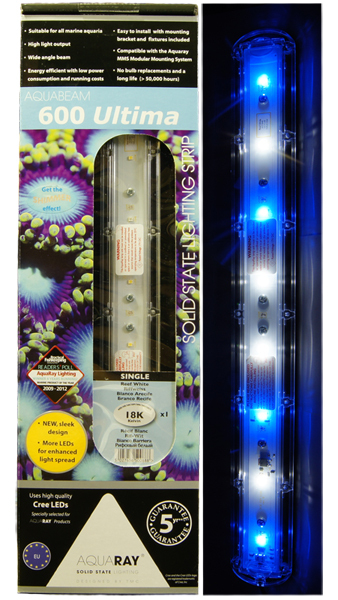 These are early test results, I will test these lights further and more importantly, continue to consult with aquarium maintenance professionals and their experiences with these new LED Lights, as I do for ALL my articles. These results will be posted as time goes on via future updates.